EXECUTED BY LETHAL INJECTION 04-21-05 12:31 AM EST. Trial:	Information/PC for Murder, Death Penalty filed (05-06-87); Voir Dire in Vanderburgh County (09-12-88, 09-13-88, 09-14-88, 09-15-88); Jury Trial in Vigo County (09-17-88, 09-19-88, 09-20-88, 09-21-88, 09-22-88, 09-23-88, 09-26-88, 09-27-88, 09-28-88, 09-29-88, 09-30-88, 10-01-88, 10-03-88); Verdict (10-04-88); DP Trial (10-04-88); Verdict (10-04-88); Court Sentencing (11-03-88). Givan Opinion; Shepard, Debruler, Dickson, Krahulik concur. PCR Petition filed 02-28-94; PCR denied 09-03-96. (Shepard Opinion; Dickson, Sullivan, Selby, Boehm concur). Petition for Writ of Habeas Corpus filed May 5, 2000 in the United States District Court, Southern District of Indiana. Writ denied 01-07-03 by U.S. District Court Judge Richard L. Young. (Appeal of denial of Writ of Habeas Corpus) Affirmed 3-0; Opinion by Circuit Judge Terrance T. Evans. Judges Frank H. Easterbrook, William J. Bauer concur. Benefiel v. Davis, 125 S.Ct. 481 (November 08, 2004) (Cert. denied). Benefiel v. Davis, 125 S.Ct. 953 (January 10, 2005) (Reh. denied). Benefiel v. Davis, 403 F.3d 825 (7th Cir. March 31, 2005). Appeal of denial of Motion to Reopen habeas proceedings by U.S. District Court, Southern District of Indiana. Affirmed 3-0. Benefiel v. Davis, 2005 WL 85417, ___ S.Ct. ___ (April 20, 2005) (Stay Denied). BENEFIEL WAS EXECUTED BY LETHAL INJECTION ON 04-21-05 AT 12:35 AM EST. 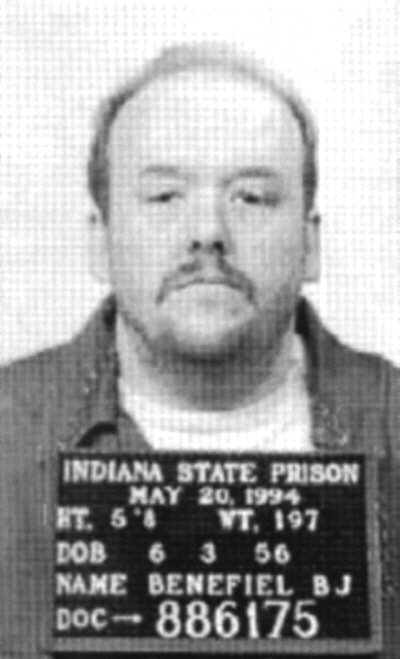 HE WAS THE 83RD CONVICTED MURDERER EXECUTED IN INDIANA SINCE 1900, AND 13TH SINCE THE DEATH PENALTY WAS REINSTATED IN 1977.